A diverse community of microorganisms guards your digestive health. But emerging science suggests they may also be the answer to greater nutrient uptake and better performance. A few years ago, if you heard the word "probiotic," it would have immediately conjured imagery of Jamie Lee Curtis selling regularity in the guise of fruity breakfast yogurt to the over-50 set. That may have been the moment when bacteria-laced foods entered your consciousness—with a maddening jingle to reinforce them—but their history goes back much farther. 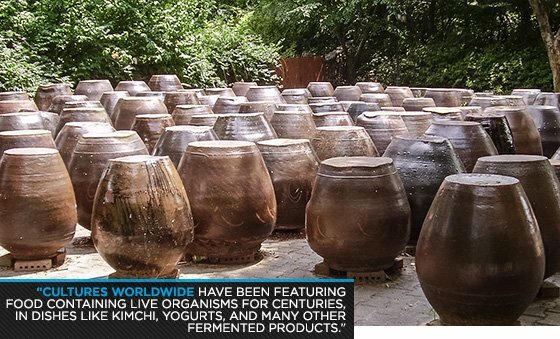 Cultures worldwide have been eating food containing live organisms for centuries, in the form of dishes like kimchi, yogurts, and many other fermented products. Part of this interest was in the name of food preservation, but some ancient cultures drew the link between fermented foods and health. In this light, perhaps we could even consider probiotics the original supplements. A few decades ago, western dairy producers took things up a notch, introducing acidophilus-fortified milk products designed to fight the ill effects of dairy sensitivity. This led to the explosion of probiotic-laced yogurts and other foods touted to contain "millions of live organisms." Today, supplement makers hope to take out the middle man via specific "gut health" supplements that take aim at everything from supporting digestive function to an overall better balance of intestinal flora. Along the way, researchers have continued to uncover new ways that supplementing with so-called "good bacteria" can impact health and well-being, for both the general populace and elite athletes. In short, it's no longer all about gas, bloating, and regularity. The known benefits now include things like immune system enhancement, better nutrient absorption, and even improved focus and mood. And while probiotics get the most press for what they do in your digestive tract while they're alive, emerging research suggests these benefits continue even after the bacteria die. The bacteria are here to stay, and that's a good thing. So let's take a closer look at how they work in you, and for you. Probiotics are live microorganisms that are most often referred to as "friendly" or "good" bacteria. In adequate supplemental amounts, they offer health benefits to the gut, including restoration of intestinal microbiota balance. They can be found in fermented foods such as yogurt, miso, and kimchi. Examples include lactobacillus acidophilus and bifidobacterium lactis. A prebiotic is a selectively fermented ingredient that acts as a food source to probiotics, which in turn promote growth of gastrointestinal microflora. Examples of prebiotics are inulin and trans galactooligosaccharides (trans-GOS). A synbiotic is a supplement that combines a probiotic and a prebiotic. The pairing increases the population and/or the function of the probiotic. A postbiotic is a metabolic byproduct generated by a probiotic organism throughout its lifespan. It is thought to be able to promote a healthy gastrointestinal tract, bolster the immune system, and aid digestion and absorption of various minerals and amino acids. Examples of postbiotics are soluble factors, peptides, bacteriocins, and organic acids. Your body is a walking, talking Petri dish. A complex community of microorganisms, known in total as "the human microbiome," flourishes everywhere from the skin to the intestines, and at many points in between. Of course not all of these organisms are beneficial; some are undeniably toxic. But a surprisingly large number are not only beneficial to their host—i.e., you—they're downright crucial. Their name reflects this: probiotic, which literally means "for life." At least 5,600 known species of these living helpers are battling for space solely in the gut—a term that encompasses the entire digestive tract, from the mouth on down through the stomach and intestines. The two best-known groups of probiotics are rod-shaped bacteria from either the genus lactobacilli, or the genus bifidobacteria. These are by far the two most commonly included probiotic strains in foods and supplements. Lactobacilli generally reside in the small intestine; bifidobacteria's natural preferred habitat is the large intestine or colon. This battle is already happening, and it lasts your entire life. It's never "won" or "lost," but you can take action help support the growth and proliferation of good bacteria. First, you can beef up their ranks by ingesting additional lactobacilli or bifidobacteria, in the form of probiotic-containing foods or supplements. You could also ingest probiotics' preferred food source, a class of carbohydrates known as prebiotics. Until recently, pairings of prebiotics and probiotics in supplements have been haphazard, but some manufacturers have become more strategic. A few years ago, MRM and its team of scientists began pairing probiotics with the prebiotics that each strain best loved to eat, calling the pairs "qualified synbiotics." The result is a line of digestive and gut health products with condition-specific formulas engineered to create optimal conditions for beneficial organisms within the gut. MRM founder Mark Olson likes to call the company's new line of gut health products "a Match.com for the most compatibility between bacteria and the food source that enables the fastest colonization of good bacteria in the gut." Probiotics deliver health benefits throughout their life cycle, but because they are living organisms, they eventually die. But that's not the end of the story. Like a dead tree continues to provide benefits to the forest ecosystem, microbiota leaves a nutritive legacy that continues to improve gut health. This legacy comes in the form of "postbiotics," which means "after life." Postbiotics are the sum total of enzymes, peptides, bacteriocins and organic aids that a probiotic accumulates during its lifespan. It's a pirate's bounty of new biological activity that only begins once a bacterial cell's life comes to a close. As the cell dies, the membrane wall collapses and a cornucopia of peptides, bacteriocins, and organic aids spill into the gut environment. Postbiotics are a nutritive broth that bathes the gut with multiple beneficial substances, according to Dr. Ralf Jäger, a sports nutrition researcher and fellow of the International Society of Sports Nutrition. Dr. Jäger has spent more than a decade studying the complex nexus between prebiotics, probiotics, and postbiotics, and he says postbiotics provide crucial nutrition to good bacteria, further encouraging an environment where healthy bacteria thrive in competition with harmful ones. "As strains of healthy bacteria move about the gut, it results in the formation of specific enzymes, peptides, and organic acids," Dr. Jäger says. "These benefit the gut in ways other than just influencing gut flora." Dr. Jäger, who worked on the science utilized by MRM in the creation of its gut health line, says the selective pairing of prebiotics with probiotics makes healthier postbiotics, in addition to probiotics. A few of the established benefits Dr. Jäger points to from enhanced gut health include strengthened immune function, resistance to diarrhea, and support for a healthy inflammation response. Dr. Jäger says that new research in the field of gut flora has the potential to aid anyone who is looking to support immune function, digestion, and gastrointestinal health. However, there are also some distinct benefits for athletes. First and foremost, postbiotic enzymes, peptides, and assorted organic materials immediately enable better absorption of certain minerals and amino acids. The healthier the gut environment, the better it will be able to assimilate nutrients—which is important for hard-training athletes who need to get everything they can out of their diet. 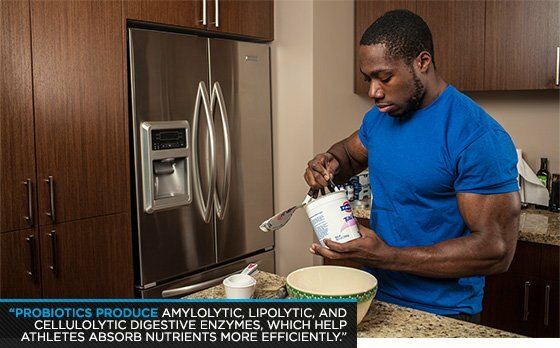 "The metabolic products of probiotics include amylolytic, lipolytic, and cellulolytic digestive enzymes, which help athletes to absorb nutrients more efficiently," Dr. Jäger says. That translates into greater gains, less product waste, and more bang for the buck on both animal and plant proteins. For athletes who overtrain, or who routinely engage in endurance pursuits and suffer from oxidative stress, Dr. Jäger says both probiotics—and their resulting postbiotics—"offer intestinal cells protection against oxidant-mediated tissue damage." Additional benefits to athletes from better gut health include the reduction in severity of upper respiratory tract infections, gastrointestinal distress, and better regulation of muscle-wasting stress hormone cortisol. Dr. Jäger says a thriving probiotic environment is also crucial to the unique relationship between the digestive tract and brain. Officially called the "gut-brain axis," this burgeoning area of research focuses on a two-way mechanism by which gut health directly affects mood and focus as well as muscular control. "The gastrointestinal tract has such an extensive endocrine-signaling system that gut health quite literally regulates sport-specific neurotransmitters such as acetylcholine, so vital to muscular contraction, endurance, and performance," he says. Dr. Jäger says further research into postbiotics will focus on developing sport-specific supplements for better performance and recovery. In the meantime, the importance of the gut will only continue to expand, not only in terms of digestion, but also in its impact on muscles and joints, nutrient absorption, and overall health. To stay ahead of the curve, Dr. Jäger recommends taking probiotics. Just as critical, he says, is maximizing the quality of internal postbiotics by ingesting adequate and appropriate prebiotics. "All of the enzymes, peptides and other organic material found within a probiotic cell are the results of an entire probiotic lifecycle," he says. "The quality of prebiotics and probiotics will influence the quality of what can be found within a postbiotic." It may seem strange or unsettling to imagine all the diverse life forms working nonstop inside you, day and night. But get comfortable with it. You want more life inside you, not less. Take care of that internal world, and it will take care of you.